Tutorial Using Anime Theme on Windows 10 Version 1809. Hello everyone, how are you today? 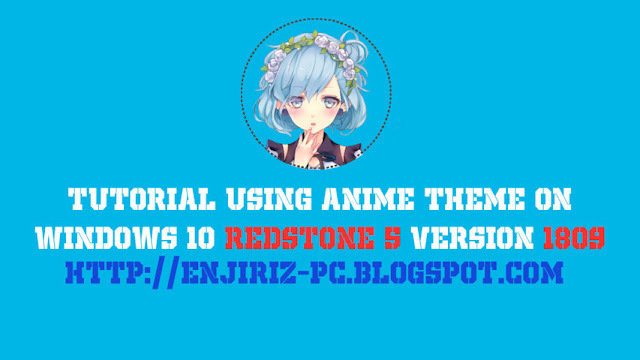 I hope all of you are in good condition.This time I will explain to you how to use the anime theme for Windows 10 Redstone 5 version 1809 which has recently been released. For those of you who have often used the anime theme on Windows 10, you must know the general things to do, patch system files first. The Windows system file patch is done in order to display the effects of the theme that you will use. The first step you have to do is to create a restore point and have a patch tool. Before the I explains what tools are used and what their functions are, please carefully refer to the patch steps that I has made to become a video. Follow the steps carefully. Because only one error can make the system file corrupt and consequently the computer can become a Blue Screen or Black Screen. The StartIsBack function is to change the appearance of the Windows 10 start menu to be like the start menu display on Windows 7. StartIsBack the I'm install here is version 2.6.4 which is equipped with a trial reset. Oh yeah, the video tutorial I chose Install for me because the admin pc only has one user. If your PC has more than one user, please select Install for everyone. The OldNewExplorer function to change the explorer's appearance to make it simpler like the Windows 7 explorer display. The Signature Bypass function is to display all the theme effects that are still covered by the basic theme of Windows 10. The Classic CP function is to add a personalize classic window to the panel in Windows 10. Actually Classic Context Menu is already in the StartIsBack setting, but because on the my PC it doesn't work, so the I chooses to install manually. Classic Context Menu function is to change the appearance of the right-click section to look like Windows 7 and also the theme effects can appear. The rest of the tools like Ultra UXTheme Patcher and Ribbon Disabler, please use them if necessary. If the theme effects do not appear in the explorer and control panel sections, you can install Ultra UXTheme Patcher, while for the Ribbon Disabler you can install it if you want to remove the upper frame of windows to look like Windows 7. That is a brief explanation of the Tutorial Using Anime Theme Windows 10 Redstone 5 Version 1809. Hopefully this article can make it easier for you to do patches. If anyone wants you to ask, please leave your question in the comments column below. Then come here for an article today, see you later in the next article.